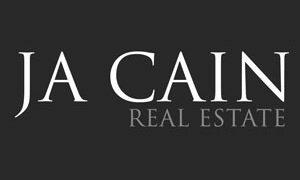 JA CAIN has been excelling in the real estate industry for 70 years and our company has always been based upon the values of integrity, professionalism and exceptional personal service. The business was first established by Joe Cain in the 1940’s and is now managed by Bryan Cain (Joe’s son), along with a dynamic team of industry professionals which include three of his children. We specialise in the sale and management of residential and commercial properties all across Melbourne, through our dependable and trusted brand and team of highly qualified and honest professionals. We pride ourselves that our company has remained loyal to our boutique nature as our high level of client satisfaction and results cannot be denied. JA CAIN is your most trusted and reliable agency when selling, renting or buying all types of Real Estate. 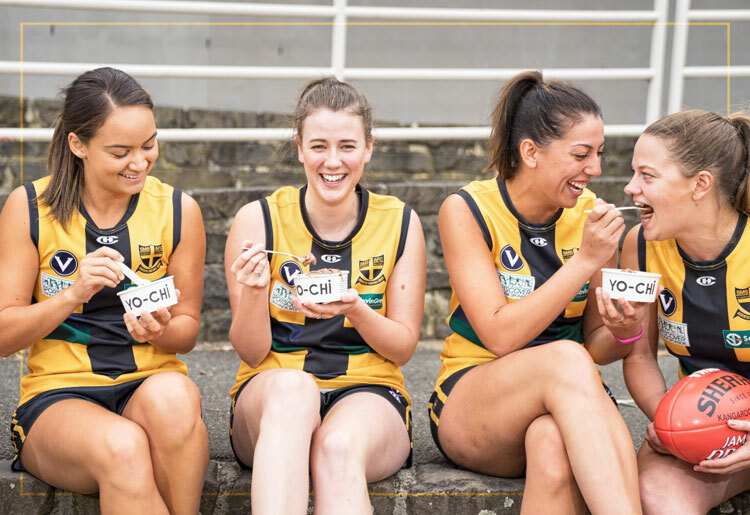 Yo-Chi is a Foundation Sponsor of our Women’s Teams. 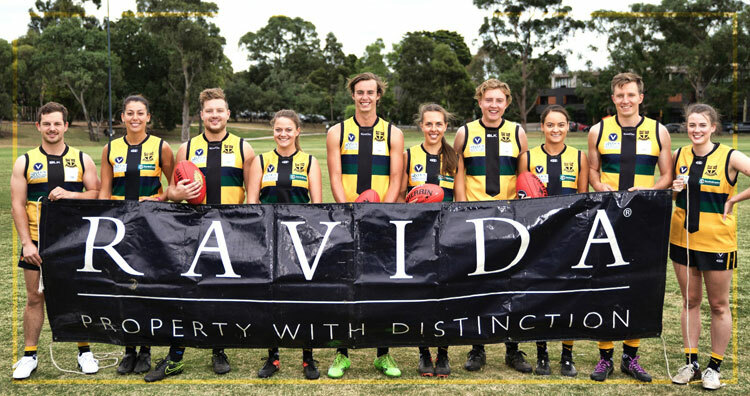 They feature on the back of the Women’s Playing Guernseys. 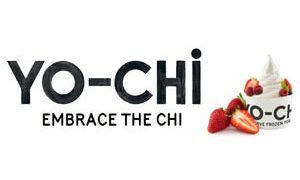 Yo-Chi is proudly home to the world’s best self-serve frozen yogurt. They offer 98% fat free, all natural gourmet yogurts, toppings & smoothies made from fresh fruit & produce daily. Their yogurt contains live & active cultures for optimum inner health and they cater to those with dairy/gluten-free or vegan requirements. They offer free wi-fi, a beautiful store environment & outstanding customer service. Locally owned & proudly Australian. Telecommunication and Internet Service Provision: provides a full range of competitively priced Telecommunications Services. Business Support Solutions: provides 24/7 Answering Services, Fax to Email, Inbound Support Services, IVRs, Marketing Services (including traditional outbound telemarketing and digital solutions), Web Services, and Cloud Products. primary focus on SME and SOHO and in the solar space. Multi-award winning Ravida Group has spent more than 30 years building luxury homes and commercial projects throughout Melbourne. Our experience and skill in residential and commercial-building has meant we have designed, developed and built some of Melbourne’s most unique and prestigious homes and commercial developments. 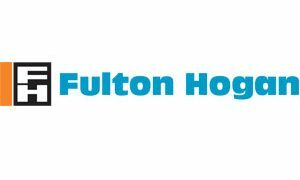 Our National Storage Hawthorn facility is situated at 660 Burwood Road, between Camberwell Road and Auburn Road. With a second site conveniently located a kilometre down Burwood Road on the corner of Golding and Lynch Streets, our Hawthorn facility can provide you with either 24 hours access or the convenience of staff onsite during access hours to help with any queries you may have. 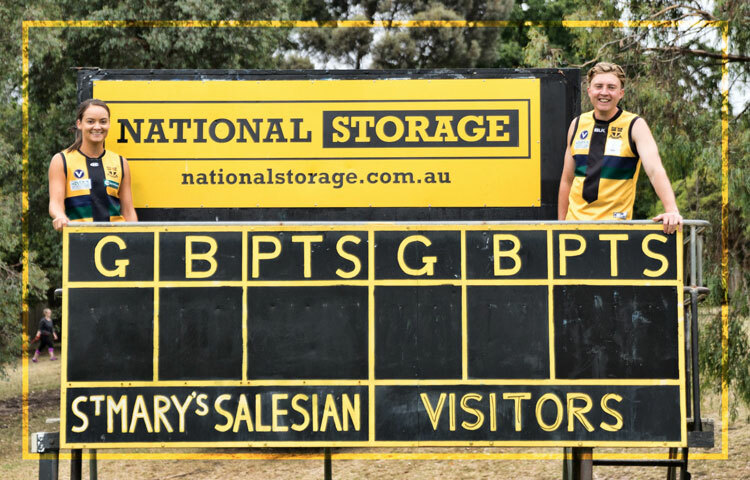 National Storage Hawthorn offer solutions for household storage, business storage and wine storage. 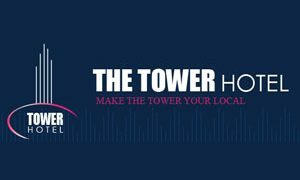 The Tower Hotel located at 686 Burwood Road, Hawthorn East has created an enviable reputation for great food & hospitality. 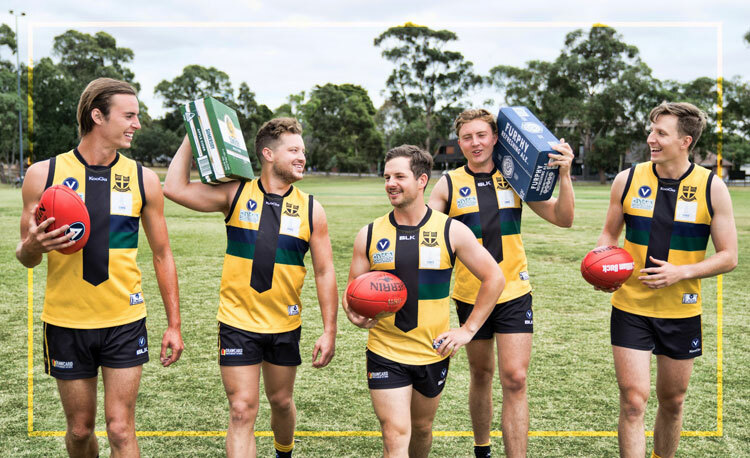 Whether it’s dinner in our newly renovated family brasserie, watching the footy on our giant screen over a couple of beers in the sportsbar, or a coporate function in one of our contemporary function spaces, the Tower Hotel is your local with the lot! You can’t beat that feeling you get when you pick up your new vehicle. At Cannon Toyota we’re committed to making the whole buying process hassle free and as enjoyable as possible for you. Our entire team, from new and used car sales, to finance and fleet, to parts and service are trained with one thing in mind ‘Customer Satisfaction’. Treating you No 1. is what we have built our business on and why we can say with confidence that ‘you can count on Cannon’. So take a look through our website and give us a call at Camberwell on (03) 9809 2466 or Heidelberg on (03) 9459 3277 and one of our online consultants will get straight back to you to help you find the vehicle you want at the price you want to pay. Roderick J. Runco & Associates offers a full financial planning service covering all of your superannuation, insurance and retirement needs. 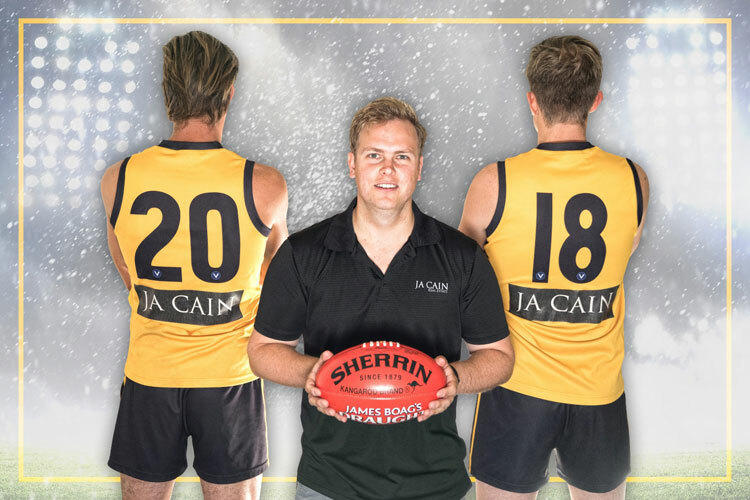 Since 1984 Rod, who played over 250 games for the Saints, has provided clients with personalised service and tailored advice. Rod advises a wide range of clients including young families, business owners, professionals and those planning for retirement or aged care. For a no obligation review of your current financial position, and to ensure you are on track to achieve your financial goals, please phone Rod on 9818 8871. We offer a simple, intuitive solution to a burning problem: how to rapidly and reliably communicate to customers or employees, where they are. At Esendex, every message matters. Our services are used by thousands of organisations to deliver SMS and voice messages quickly and effectively. The highest level of service ensures that your message is a priority, every time you press send. Kylie is a Personal Travel Manager, and whether you’re travelling for business or for fun, she will work closely with you to create a tailor-made trip that’s as individual as you are. Kylie has 22 years of experience in leisure and corporate travel and can offer your family or business a professional service with 24/7 access in times of emergencies. Kylie has had a long association with St Mary’s Salesian. She is the wife of Dale Andrews, who is a past President, a Life Member, Gold Saint and past player, and she was club treasurer 1997-99, and ran the canteen for about five years. 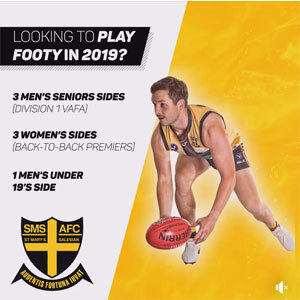 AFL Coaching: Aimed at youth/adult players aiming to maximise their potential in the game of AFL through specialised 1:1 or small group training sessions and individualised development programs. 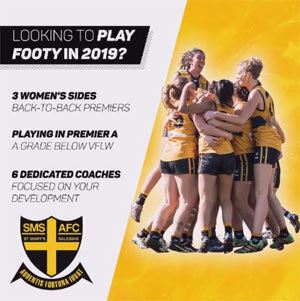 Coach Mentoring: Aimed at beginner or intermediate AFL coaches at all levels who wish to take their coaching to the next level through a specialised, ongoing 1:1 personal development program. VICPOLE is a family company owned by the Vickery family, and since 1991 has been manufacturing light poles and supplying streetscape products for residential developments, and commercial and sporting projects. Drawcard Entertainment Vic was formed back in 2004 by Principal Norbert Graetzer and Manager John Wells who have had over 40 years experience in the entertainment and events industries. Since coming together they have been responsible for some amazing productions including many charity functions.